I have been a maker all my life. The art making process has been something necessary, uncontrollable and the most important part of what makes me who I am. I became aware of the insistent creative drive when I discovered clay at school; while others were throwing it at each other I became immersed in shaping objects and creatures. My creativity is thus rooted in the tradition of ceramic vessel-making, which I pursued for 25 years. I also have a professional interest in psychology, which feeds into my work. Ten years ago I discovered glass. It has offered me a method of transposing images from my inner world and providing a place for them to inhabit. What is revealed in my drawings I bring into glass - fluid, dense and constructed - in multiple layers and numerous firings, to create a personal language. This three-dimensional transparent medium allows my work to be experienced in multiple ways: entered into, surrounded by and engaged with. I have transferred many ceramic skills as well as my sense of aesthetic to glass, and find that its transparency offers exciting opportunities to explore the internal canvas of the containing space. I produce pieces made for contemplation. For me the work aims to embody some of the complexities inherent in contemporary culture. It also offers a window into an inner world. My recent work involves layering sheet glass and cullet, which is cast into metal and ceramic moulds several times until the required movement has occurred. I grind the surface to reveal the internal structure created by the casting process. The glass is then kiln-formed into ovoid or spherical vessel forms, which I subsequently cut and polish. A significant influence in my new work is our ancestral home, the sea, and some of the less visible organisms that inhabit it. I am particularly interested in diatoms - the outer shell of single cell phytoplankton - which are themselves made from silica, the main glass-forming agent. Diatoms occur in virtually every environment that contains water, and play a significant role in the conversion of carbon dioxide to oxygen in our planet’s eco-system. Their translucency and textures are qualities which I am currently exploring. It is the sea that creates the possibility of glass, in the form of sand, through erosion. Perhaps it’s for this reason that I am continually drawn back to the tide line, where water and land meet, for inspiration. Please feel free to download my full CV here. 1984 - University of Portsmouth | Cert. Ed. Member of Crafts Council education and mentoring panels. Providing Art Therapy as part of Clinical team working with residential Adolescent male substance misusers. Pottery skills NTDI Clonakilty. Re-integrating adults back into the community. Established Amberley Chalk Pits Pottery West Sussex England. Produced traditional domestic earthenware, architectural ceramics and provided an educational resource within a living museum environment. Ceramics, Art & workshop skills. Working with adolescents with learning difficulties, adults and pre degree students. As a qualified teacher and art therapist, Michael has worked creatively in many different areas, from nursery, primary, post primary, further and higher education, to rehab centres, hospices and community arts projects. Michael regularly exhibits nationally and internationally, most recently in America and China. Elements: Sheng Ling Gallery, Shanghai. Engaging with Glass: Tacoma Travers Gallery USA. Engaging with Glass. Juried exhibition, Solstice Arts Centre, Navan. 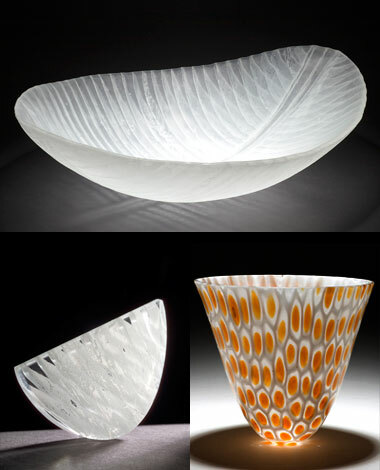 Illuminate: Contemporary Irish Glass, The Kenny Gallery, Galway. Organic Geometry. National Craft Gallery, Kilkenny. Masters Show: National College of Art and Design Dublin. Reflexivity. Selected Glass Exhibition, Cambridge Gallery, England. Visions in Glass: Selected Exhibition, Jerpoint Glass, Kilkenny. Glasshaus IV: Selected Exhibition, Parndon Mill Gallery, Harlow, Essex. Asssistant to Patrick Dougherty large scale willow sculpture installation. SOFA with Crafts Council, Navy Pier, Chicago, USA.Two pieces purchased by National Museum of Ireland for contemporary glass collection. St Patrick's Presence, Leicester Square, London. Collectors' Event: Hunt Museum, Limerick and National Craft Gallery. Purchase Award: Crafts Council of Ireland Collection. Vacant spaces:Bere Island Residency/ glass and sound installation. Community project installation: Bantry library, with Marie Brett. Awards for Irish Derby at the Curragh. Royal College of Surgeons, Annual awards. Three pieces commissioned for Dept. of Foreign Affairs. Presentation pieces AIB Bank, Poland. National Growers Awards For Bord Bia the Irish state food agency. Presentation piece for National Lottery. Five pieces commissioned for Dept of Foreign Affairs. National Food awards for Bord Bia, The Irish State food Agency. Two pieces commissioned for Irish Embassy collection. After an initial enquiry and discussion about a possible commission, a site visit is arranged where ideas can be explored further, and estimates assessed. A visual representation is then provided by Michael, either in person or via email, and on approval of the design and estimate, a deposit is paid and the commission undertaken. A complete installation service is available, or supply only, depending on the wishes of the client. For further enquiries you can email me here. Department of Foreign Affairs Ireland. Michael’s work is held in public and private collections throughout the world.